How good are the Velashape promises? VelaShape is the “new” name for the “old” VelaSmooth machine. They took the old machine, modernized it a bit and gave it a modern name. It’s hook is that the FDA has given the company who makes the machine and all the ‘medi-spas’ permission to market the treatments as a possible way to temporarily reduce the appearance of cellulite. Sounds hopeful but let’s look a little closer. Is a temporary solution for the reduction of cellulite good enough for you? Or, would you rather go for something more permanent? Is it possible that with a better understanding of what cellulite is, you can get smooth skin permanently? Let’s dig deeper to find out the answer. 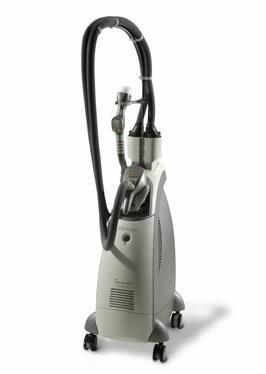 Velashape is one of the newest massager laser treatments to try and conquer the brutal battle with cellulite. But can this machine that has been called both a Star Wars-like R2D2 robot and a Hoover vacuum cleaner with heat do the trick? It’s hopeful – the idea of ridding yourself of cellulite with an elaborate massage device. It’s popular, embraced by some of Hollywood’s elite. But is the science behind the theory of Velashape’s promise to temporarily reduce the appearance of cellulite good enough to jump on the bandwagon? First of all, consider the mixed reviews by patients of the Velashape system. To get the best results, the company suggests that patients sign up for several treatments ranging from 12-14 at a cost that usually exceeds $1000. Then, it is advised that the patient continue on a long term maintenance program, after the initial series of treatments. The first question that usually goes through the mind of someone considering Velashape is whether or not it will work. And, unfortunately, they cannot be given a definitive answer. However, they can be told with much certainty that any results seen in the reduction of the appearance of cellulite will be temporary. That is what the FDA has approved for marketing the treatments. Temporary results. With the reality that the results may or may not happen; and the promise that any changes in the texture or appearance of cellulite will be temporary, the person considering Velashape will then decide whether or not the cost warrants the procedure. Next, a potential patient of Velashape will consider whether or not there is another option. Perhaps one that won’t take such a bite out of their wallet or one that will give results that are more permanent in nature. After all, if you are going to spend time and effort to get rid of cellulite, doesn’t it make sense to find something that will work? The next logical step is for the potential patient to seek out and discover what cellulite actually is. Once that’s understood then it is much easier to determine what type of treatment or approach will give you the best chance of eliminating your cellulite. Velashape presents an unproven theory that cellulite is fat that must be massaged and manipulated. When that’s done they say that blood flow increases, the lymph nodes are activated, connective tissue is broken down, and cellulite is erased. That’s the idea, anyhow, behind Velashape and its dual massagers and suction mechanism. However, that’s not exactly accurate. Cellulite does involve fat and it does involve muscle. But it has nothing to do with blood flow, drainage, toxins or breaking down the connective tissue. When your body is healthy and cellulite-free it is because the underlying muscle layers are firm enough to provide a sturdy foundation for your skin and that underlying, protective layer of fat that sits right below it. And, most people know that in order to get firmly lifted muscles, they need to be stimulated properly. Not just the big ones, but also the smaller ones which are usually neglected by most generic exercises and fitness routines. So you get to choose between wasting some serious cash, with no promise of results or taking a little time, several days per week to stimulate the deeper levels of your blessed body to see the beautiful results on the outside – results which last a lifetime.